Miss Rose Theresa "Terry" Rester of South Coventry, Connecticut, was born December 16, 1916 in Glastonbury, daughter of Hungarian born parents Mary (Knutz) and John J. Rester. 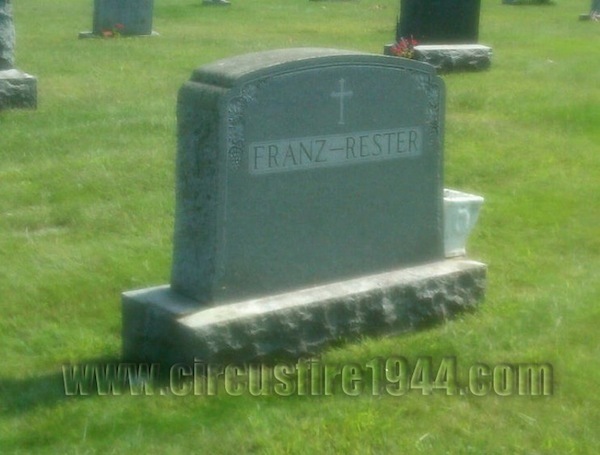 She and her sisters Elizabeth Rester, 24, and Mrs. Mary Franz, 30, were found dead at the circus grounds after the fire on July 6 and were buried at St. Mary's Cemetery in South Coventry after services at Killourney Brothers Chapel in Willimantic. Miss Rester leaves her parents, of South Coventry, and her brothers John Rester, 34, Martin Rester, 32 and Frank Rester, 14. Another brother, Joseph Rester, passed away in 1932 at age 11. 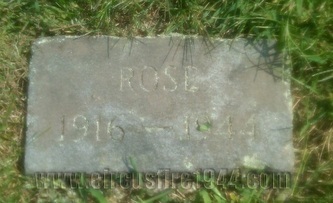 Body #1578 was identified at the State Armory as Rose Rester by her father, John, on July 7. In addition to her sisters, Terry's nephew Billy Franz was also a victim of the fire. Prior to her death, Terry was employed as a "war worker" at Pratt & Whitney in East Hartford. Her estate was awarded $9,500 by the arbitration board.